Since Windows 7, one feature that’s been greatly enhanced in Windows is the ability to instantly connect a projector using different options depending on your needs. Using a simple keyboard shortcut, you can quickly duplicate your screen, extend it or just have it appear on the projector only. In this article, I’ll show you how to connect to a projector in Windows and select the best options for displaying a presentation. Before you display content on a projector, you have to be certain that Windows recognizes that a projector is connected to the PC and is properly configured in the operating system. First, consult the documentation for the projector about connecting and configuring the device with your computer. Some projectors connect to your video card while others connect through a USB port. Pay particular attention to the order in which you should set up the projector. Setting up most projectors on a Windows computer is like setting up a printer. First, you connect the projector to the computer. Then, you install the correct drivers from the disc that came with the projector or download them. Finally, you restart your computer and check to see that the projector is recognized by Windows. To check to see whether your projector is properly recognized, click on the Start button, right click on My Computer (or This PC), and select Manage from the menu. 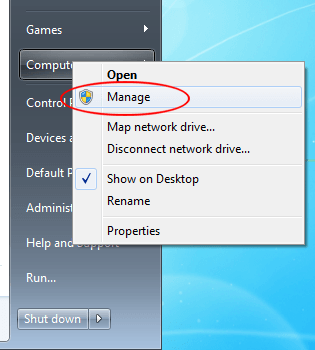 With the Computer Management window open, click on Device Manager in the left hand column. In the center column, look to see that your projector is connected and ready for use by Windows. 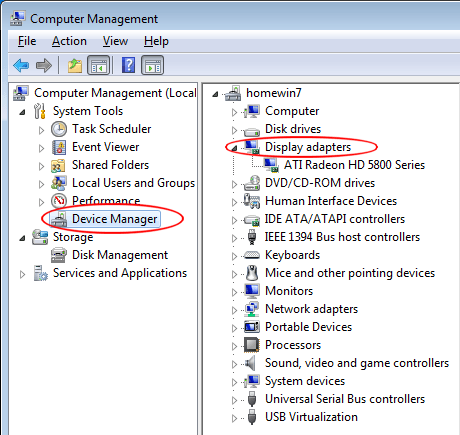 Depending on the make and model of your projector, it may show up in one of two places in Device Manager. First, look under Display Adapters. If it is not there, check for its own entry in the center column. Once you have determined that Windows recognizes the projector, you are ready to connect to it and start using it in your presentation. Microsoft really had convenience in mind when it added such a simple method of displaying content on a projector. Once connected to a projector, simply press Windows Key + P to select one of four connection options. Below is a description and some hints on choosing one of the four projector connection options in Windows. If you are running Windows 8 or Windows 10, the options show up on the side rather than across like the screenshot above. Computer Only (PC Screen Only) – This option displays the contents of your computer screen on the computer only. This is a great option to choose when your presentation hasn’t yet started or if you want to use the computer for another reason and don’t want the contents of the screen displayed through the projector for all to see. 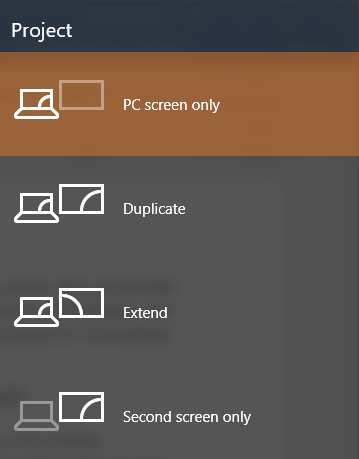 Duplicate – This option simultaneously displays the contents of the computer screen on the computer screen and through the projector. This is a great choice when your back will be toward the projector’s screen while giving a presentation. This way you can watch the computer screen while the audience watches the projector screen and you won’t have to continually turn your back to the audience during the presentation. Extend – This option splits the image between the computer and projector. This way you can display one thing on your computer screen and something else on the projector screen. This is great when using PowerPoint so the presentation is displayed on the projector while your presentation notes are displayed on your computer screen in front of you. Projector Only (Second Screen Only) – As its name implies, this option will display the content of your presentation on the projector, but show a blank screen on your computer. Although not a popular choice, this is a good option when you are running your presentation from your laptop on battery power. Turning off the laptop screen can help preserve battery life. Connecting a projector to a Windows computer is quite simple once you know how. Using the four options mentioned above, you can set up a custom display that meets your personal presentation needs. If you have any questions, feel free to comment. Enjoy!